There are pros and cons, supporters and enemies of rental scooters and bikes, but the question still remains if this form of transportation has or will reach local boating communities. SOUTHERN CALIFORNIA—By now, most folks residing in Southern California have seen the notorious e-scooters and bikes. Corporations like Lime and Bird Scooter have been dropping the rental scooters all over the nation with little to no warning. Anyone can then access the bikes and scooters through a mobile app on their phone, which in some ways, might be seen as a blessing or a curse. Initially created to get locals to drive less, decreasing emissions from cars that cause pollution, some coastal cities and communities have not taken e-rental bikes and scooters as kindly as others. Lime, as an example, encourages safety on the roadways and urges riders to take “The Respect The Ride Pledge.” Safety has been a paramount issue. City staffs all over the country, including San Diego and Los Angeles, have worked with the corporations to create a plan for use. Some places have even wanted to amend legislation for additional revenue. For instance on the East Coast in Baltimore, Maryland, a historic coastal city, officials have proposed legislation for those riding a rental scooter too fast on some city sidewalks should face up to a month in jail or $1,000 fine. In an article by The Baltimore Sun, a spokesman for Baltimore Transportation Department said it was an intention to cite scooter riders for reckless riding. Long Beach, like Baltimore, has seen the scooters as an opportunity to boost revenue and hope to successfully regulate them. Further, city officials have noticed by not moving to set standards in place they have unintentionally lost a sum of money. During a conversation with a former colleague, she mentioned the annoyance of seeing the scooters/bikes strewn around Orange County and suggested the corporations releasing such mayhem on communities should find ways to fine patrons if they did things such as vandalize the bikes or threw them in the ocean (a problem San Diego Port authorities have seen in the past). The hands-off approach that Bird and Lime take does leave a bad taste in the mouth of some, such as city officials in Redondo Beach who also recently moved to ban the scooters. Citylab, in a recent article, claimed two UCLA hospitals in Los Angeles and Santa Monica reported 249 emergency room visits between Sept. 1, 2017 and the end of August 2018. The majority of victims, 91.6 percent in fact, had fallen off the scooters, collided with an object or were struck by a vehicle. None of the injuries reported were fatal, but two patients were sent to an intensive care unit. It is still unclear whether rental scooters or bikes are causing more accidents or deaths than usual. While accidents or even deaths could happen in many ways, the sudden rise of the scooters and bicycles that police, harbor departments, and other city official were unprepared for could be problematic. Similar to statistics related to automobile or boating deaths, it could be assumed rider error is due to most mishaps on the road. In their first year, Bird Scooter reported 10 million rides nationwide, which means that users are certainly accessing the scooters. How are e-scooters affecting boaters anyway? Last year, The Log’s resident boater Capt. Nicole Sours Larson wrote about dockless bikes and scooters in her column Dock Lines. She had relatively kind things to say about the new form of transportation and reported similar responses from marina managers. Though he stated he was not an authority on the subject and felt his jurisdiction ended where the land began, Commissioner Paul Blank of Newport Beach Harbor Commission, told The Log in an email that he felt dockless scooters could potentially have positive benefits in marina settings for visitors. “It would seem a logical extension and an opportunity for visiting boaters to get around on land,” Blank said. Oceanside Harbor Manager Ted Schiafone said e-scooters have not been a problem in his region. “At this time there are no Bird scooters or dockless bikes in our market, so it’s not an issue at Oceanside Harbor,” Schiafone said. Mick Kronman, Harbor Resources Manager in Santa Barbara, also reported they had “no impact” after the city had moved to ban the scooters. 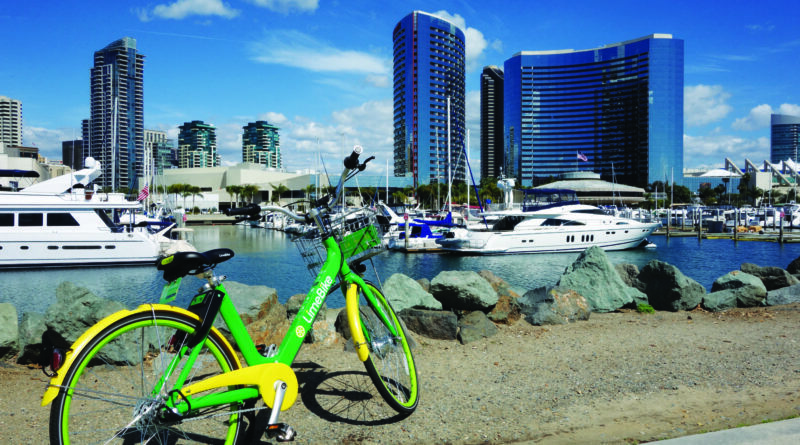 In the past, San Diego Harbor Patrol has expressed some frustration with Lime bikes. During a coastal cleanup event that took place last year, some of the rental bikes and scooters were even pulled from waterways. Other public representatives were contacted for commentary in San Diego and Los Angeles, but either declined to comment or did not respond in time for press. The Bird Scooter corporate office was also contacted and also did not respond by press time. These modes of transportation do not seem to be going away anytime soon with many cities creating plans to incorporate them. While boaters could not ride these scooters or bikes on the docks, are they generally welcome or are they simply unnecessary? Will they find a way into marina- and harbor-use more frequently in coming months? Or is this just another trend that will ultimately pass? Is this a serious issue or should people just lighten up and enjoy the fun? If any boaters have opinions on dockless scooters and bikes, please leave a comment online or contact editor@thelog.com to share feedback.